Things to do in Queenstown are to make the visitors stay entertained and excited. With incredible backdrop with beautiful range of sights, Queenstown is ready to entertain every visitor who comes over. In this city, each season has special vibe so it means every season to visit Queenstown is always a good idea. Let’s explore what this city has to offer and the best ways to enjoy all the attractions. A Bob’s Peak overlooking the city of Queenstown is a fantastic place which is a part of mountain Ben Lomond. To hike up to Skyline complex, the locals usually take an hour. But some visitors who are not used to hiking, it may take a bit longer. What makes this hike great is it takes you through the forest with fantastic views at the top. Up on the Ben Lomond mountain, there are many hikes and trails that are ready to be explored. You can also do the hike using a bike if you consider yourself a mountain biker. Here comes another exciting and entertaining thing to do in Queenstown, taking the gondola. This gondola offers a much less strenuous way to walk around the Bob’s Peak without having you to do the hiking. Instead, you just get on and sit inside the gondola. It takes you to the steepest gondola trail in Southern Hemisphere yet it is considerably quick. It is not cheap but it is worth the views and exhilarating moments. There are two different luge tracks when you arrive at the top. The tracks are the place where you can sit in the wheeled sleds made from plastic in small size before you race down with your adrenaline rushes. A perfect way for adults to have fun. On the trail, there are so many great views you will want to keep in your mind forever. If you want to experience this fun luge, pay $48 for 4 rides or $55 for 5 rides. There is also the single luge ride but only for those who are brave enough because it is much more dangerous. Who doesn’t know bungy jumping? In New Zealand, this sport has always been so popular especially with the fact there are many challenging bungy jumping spots in this country. This time, the commercial bungy is located in Kawarau known as Nevis Bungy which is almost 450 feet above River of Nevis. It takes 45 minutes to get here from the town. 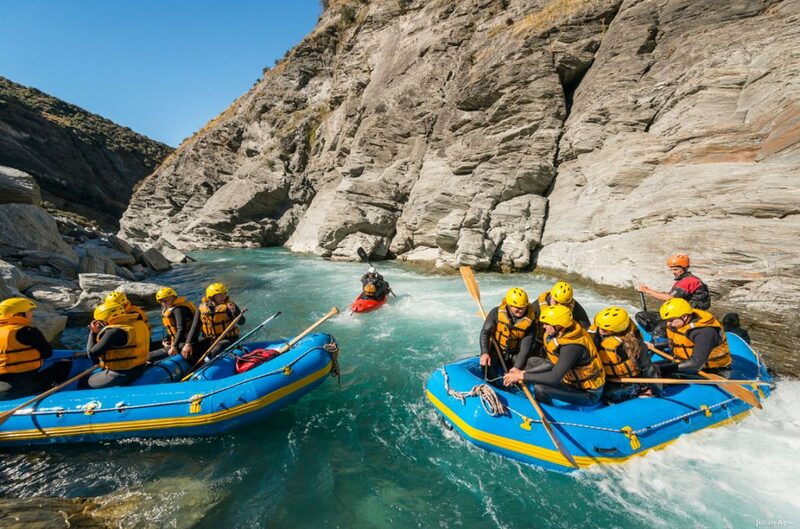 It makes another popular choice of things to do in Queenstown.